A green group has reiterated calls for the Scottish Government to ban fracking outright as Ineos’s first shipment of ethane from the US nears the firm’s plant at Grangemouth. Friends of the Earth Scotland said fracking was highly destructive and should not take place in Scotland or anywhere else. And residents of Pennsylvania, home to large-scale fracking operations, warned that quality of life in the state had been profoundly affected. First Minister Nicola Sturgeon said last week that the fracking moratorium would remain in place into next year. It was first introduced in January 2015. A spokesman from Ineos, which wants to frack in Scotland, was quoted as saying in a media report that the Grangemouth site would have to be shut down if it could not import US shale gas, leading to thousands of job losses. Ineos boss Jim Ratcliffe has previously called the Scottish Government’s moratorium absurd and said that Scotland would need income from fracking if it ever got independence. A Dragon Class ship carrying ethane from fracking is slated to arrive at the petrochemical plant on Tuesday. Ron Gulla, a former resident of Hickory, Pennsylvania who signed a lease for fracking on his land in 2002, said he had witnessed first-hand how the fracking industry had brought permanent damage across the region. Karen Feridun, founding member of Pennsylvanians Against Fracking said: “The 9,900 unconventional wells already in the ground in Pennsylvania represent less than a 10th of the number the industry would like to drill. The impacts to the environment, human and animal health, safety, property value, and quality of life have been profound. Ms Church added: “Setting aside the devastating local impacts of fracking, the climate consequences of extracting yet more fossil fuels are utterly disastrous. 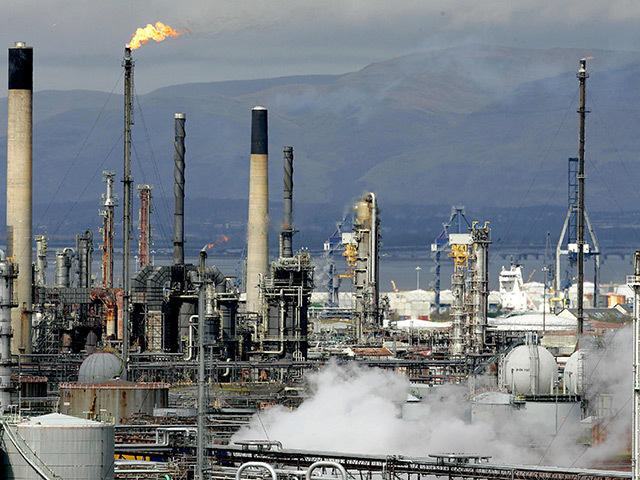 If Jim Ratcliffe was really concerned about the future of the Grangemouth plant and its workers he would be planning for its transition to a low carbon model.